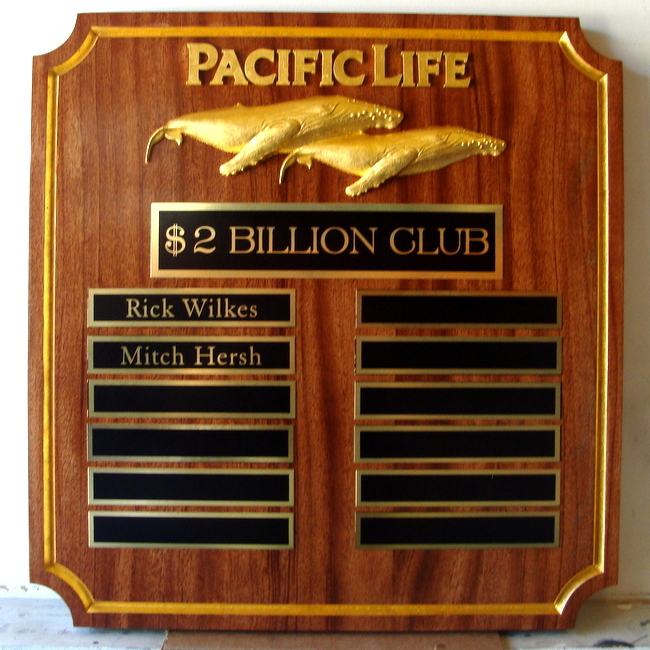 M7343 - Mahogany Wall Plaque for $2 Billion Club of Pacific Life, with Golf-Leaf Gilded Text and 3D Carved Whale Artwork. Above is a photo of a mahogany wall plaque for the $2 Billion Club of the Pacific Life Insurance Company. The large raised text "PACIFIC LIFE" and carved 3D whales are gilded with 24K gold leaf. The gold text on the black acrylic plaques is painted. Gold always look elegant on dark stained mahogany wood. This wall plaque is 36 inches high.